MONDAY, 14 MARCH – Universiti Malaysia Sabah (UMS) continues to play a role as a centre of higher learning through the sharing of knowledge and research studies with the public. Recently, UMS through the Institute for Tropical Biology and Conservation (ITBC) organised the UMS Borneensis Friends 2016 Programme involving 30 students from five secondary schools in Sabah. 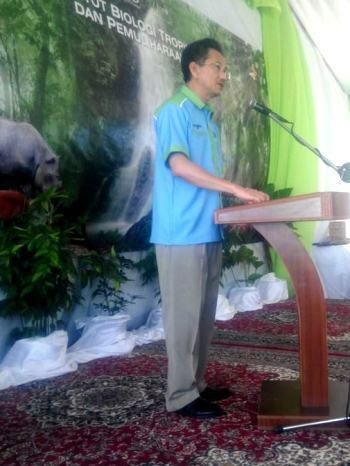 According to the Vice-Chancellor of UMS, Professor Datuk Dr. Mohd Harun Abdullah, the three-day programme was aimed to educate and raise the awareness among Malaysians on our natural heritage. “The programme, which is implemented using biodiversity specimen collection is important to motivate the young to engage in nature conservation and research in the future,” he said when officiating the closing of the programme. He said, Sabah was famous as the world’s major centre for biodiversity, having the largest conservation area of over 400,000 hectares. “Thus, ITBC UMS as the university’s centre of excellence bears the responsibility to highlight the strength of studies in the field of biodiversity and the effectiveness of environmental education for the benefit of the local and international community,” Datuk Harun added. The five schools involved in this programme are Sekolah Menengah Kebangsaan (SMK) Likas, SMK Tebobon, SM St. Michael, SM All Saints and SMK Arshad.